Microwave – and other forms of electromagnetic – radiation are major factors in many modern unexplained disease states. Stop Smart Meters! Nominated for 2014 Luddite Award—VOTE! An extremely articulate and heartfelt testimony by attorney Jimmy Gonzalez to his Pembroke Pines City Council regarding cell phone radiation and cancer. He developed three tumors, each in locations of cell phone contact and died this past November. If you are inclined, please pass this on in his memory and to warn others that cell phones cause cancer. The Radiation from WiFi is Cancer Causing! The following study out in 2011 support the logical conclusion that being exposed to WiFi (and more than often many sources of multiple WiFi signals) 24/7 is a potential risk for a cancerous condition. Today we are all literally drowning in an acidic sea of EMFs. 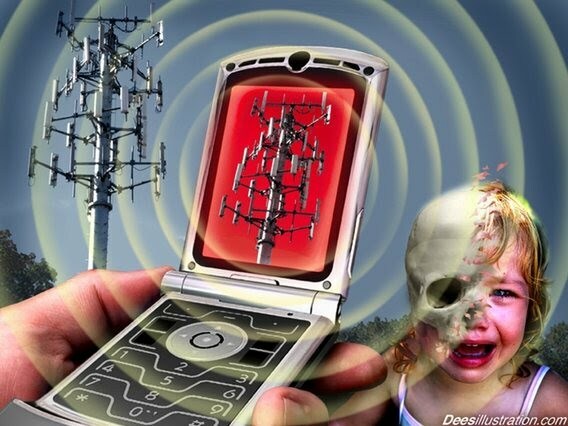 The long-term exposure to microwave radiation from WiFi provokes the cellular transformation of healthy body and blood cells into cancerous cells leading to a cancerous condition or diagnosis. The U.S. Department of the Interior accused the Federal Government of employing outdated standards: “the electromagnetic radiation standards used by the Federal Communications Commission (FCC) continue to be based on thermal heating, a criterion now nearly 30 years out of date and inapplicable today.” The standards violate federal law as they endanger federally-protected wildlife species which suffer adverse effects from cell tower radiation exposure. Four resolutions signed by 98 scientific experts were submitted to the FCC which resolutions call on government to issue stronger regulations on wireless radiation, especially cell phone radiation. The City Council of Berkeley, California directed the City Attorney to draft a cell phone “right to know” ordinancethat would require retailers to provide consumers with a fact sheet regarding the cell phone’s minimum separation distance from the body. Harvard law professor Lawrence Lessig has offered to defend this ground-breaking ordinance should the CTIA—The Wireless Association sue the City. The iPhone 6, like most smart phones, has several transmitters that simultaneously emit microwave radiation. When these transmitters are turned on the radiation emitted by this phone is close to the SAR legal limit; thus, one should turn off any transmitters not in use (e.g. Wi-Fi) to reduce exposure. According to Apple, the iPhone 6 should be kept at least 5 millimeters or two-tenths of an inch from the body whenever it is turned on (i.e., the device’s minimum body separation distance is 5 mm). Listed below in order of popularity are the ten most popular wireless radiation news releases distributed this year through PRLog, a press release distribution website, and the ten most popular articles postedbon the Electromagnetic Radiation Safety website. In 2014, the news releases received over 65,000 page views, and the website received 130,000 page views from visitors in more than 100 countries.